And that's a wrap. We've had an awesome year of bringing the band back from the dead, and now it's time to call it done. Thank you to all the people that came to see us play and the venues that had us perform. We'll keep sharing info when we have it about any more reissues of our records or more music we're putting out with our individual bands. In the meantime, here's a few photos from the reunion. Blast for Humanity has issued live audio from our first reunion gig from CBGB's on vinyl. Enemy Soil has reformed for the second time and is playing some shows in 2018. The band's reunion lineup is made up of old Enemy Soil members Richard Johnson (currently in Drugs of Faith and Agoraphobic Nosebleed), JR Hayes (Pig Destroyer and Virginia Creep), Adam Perry (Vastum), and Mason (Reeking Cross). 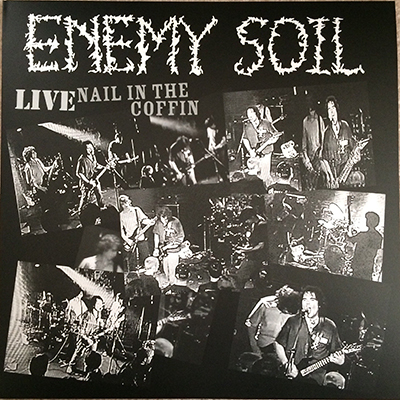 After originally breaking up in 1999, Enemy Soil reformed for the first time in 2001 to play the Loud Az F*ck festival at CBGB's. 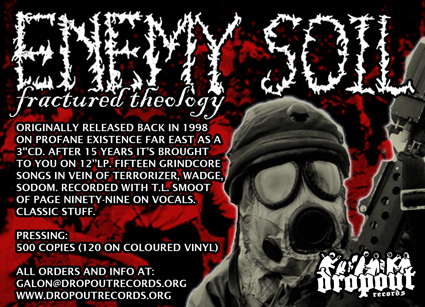 Follow Enemy Soil on Twitter and Facebook. 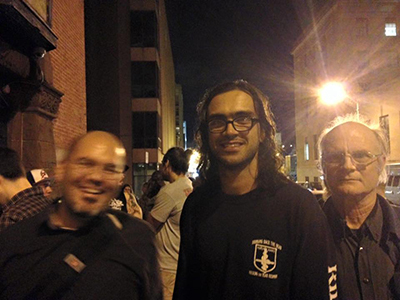 Here we are with ex-drummer Adam (center), who was in the area for his tour with Vastum, and his ever-supportive Dad (right). Relapse Records has been posting about each of their releases in order as part of their 25th anniversary celebration. They rightfully included Casualties of Progress among them. Here's their post on Facebook. Dropout Records from Poland has repressed the Fractured Theology 3" CD on 12" vinyl! In Terrorizer Magazine #131's Grindcore Special part 2, a three-man panel ranked Enemy Soil's Casualties of Progress #5 in a top-20 list of essential U.S. grindcore releases. Find more information about the Casualties of Progress CD from Relapse.